The international development secretary, Penny Mordaunt, has been forced to retreat from her government’s repeated claims that the UK is a “global leader in disability rights”. Her government has faced anger from the UK disabled people’s movement at its decision to co-host a Global Disability Summit in east London less than a year after the UN’s committee on the rights of persons with disabilities (CRPD) found that its cuts to disabled people’s support had caused “a human catastrophe”. The committee told the UK government last September – when Mordaunt herself was minister for disabled people – to make more than 80 improvements to how its laws and policies affect disabled people’s human rights. It was the highest number of recommendations CRPD had ever produced in reviewing a country’s progress in implementing the UN Convention on the Rights of Persons with Disabilities. The committee also made it clear to the government that the UK was no longer considered a world leader on disability rights. But the government has repeatedly disagreed with the UN’s conclusion. Last November, the new minister for disabled people, Sarah Newton, said that the UK “continues to be a global leader in disability rights”. The Department for Work and Pensions (DWP) said last October – in responding to CRPD’s findings – that the UK was “a recognised world leader in disability rights and equality”. And last October, Mordaunt herself said the government wanted to “establish the UK as a global leader” in disability and development and that she was “keen to promote what we are doing [on the domestic agenda]because it is a catalyst for change elsewhere in the world”. 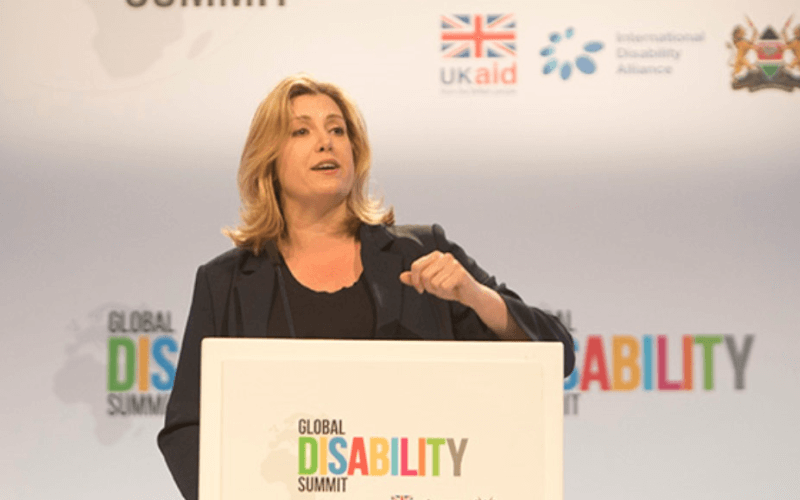 But in an interview with Disability News Service (DNS) this week at the summit – a major international disability rights conference focused on the global south – Mordaunt distanced herself from those claims. When asked if it was hypocritical for her government to hold itself up as a world leader on disability rights while co-hosting the summit, she said: “I think you’re putting words into my mouth, we are not holding ourselves up saying that we’re perfect or we have all the answers and I’ve been very clear in all my communications about this summit that that is the case. She added: “This is not about the UK either preaching to other nations or not including ourselves in the list of nations that need to do better. This week, Mordaunt (pictured, at the summit) and her fellow ministers have been encouraging other countries and organisations to sign up to a new Charter for Change, calling on them to “hold ourselves and others to account for the promises we have made here today” and to “strive for real change through the convention’s implementation”. But Mordaunt has now criticised the UN for its attempts to do just that. Mordaunt made a series of announcements at the summit to demonstrate the government’s commitment to supporting disabled people in the developing world, funded through the UK’s continuing legally binding agreement to spend 0.7 per cent of national income a year on foreign aid (about £14 billion in 2017). She committed the UK government to a new global partnership – AT Scale – to “transform access to and affordability of” assistive technology, such as wheelchairs, prosthetics, hearing aids and glasses, with the aim of reaching 500 million people globally by 2030. She also announced a new UK Aid Connect programme, led by disability charities Sightsavers and Leonard Cheshire, which will work with organisations within small communities in the developing world to support disabled people into jobs. There will be a six-year programme to design ways to help 100,000 disabled people to access health services, 10,000 disabled children to access education, and up to 45,000 disabled people to increase their incomes. And Mordaunt said that her Department for International Development would work with businesses to support disabled people as employers, employees and consumers.